Wedding Veils, Bridal Veils, should I have one? Veils - Should I or should I not? To have a veil or not, is this your question?! Some brides-to-be know for sure, even before they have their dress, that they're a veil type of girl. Some know exactly the type of veil they want to go for, and have pictured it for years in their head. Others could be swayed - how long should the veil be, should it cover their face, their head, or simply the shoulders or back? Should they wear the veil at the reception too? How much should they spend on the veil? Should it be embellished? This lovely image above, which is from the Blog of Honor, illustrates some of the different lengths of veils typically worn at weddings. Although it excludes some more modern ones, such as the birdcage veil, alternative ways of wearing the veils (e.g. boho style) and any other funky or asymetrical styles, it is a great illustration for the traditional brides. Shopping for a veil could be as complex or simple as shopping for a wedding dress. Ultimately, the best advice is to try a few (with your dress on ideally), fall in love in one, and buy it. For some other brides-to-be, a veil is out of the question. Perhaps because they don't like wearing big adornments on their head, perhaps because they're having a more modern wedding, or perhaps they're simply not bothered and it just seems a bit superfluous. I personally did not wear a veil, but to be honest, I don't really know why! I think that I was going with the flow and veils did not seem to be highly fashionable at the time I got married. In fact, I remember distinctly that of all the catwalk shows I attended, none had a model wearing a veil. Veils just seemed to be a very low priority for me a the time. Now, as a bridal accessories designer, I love veils! Rather than the traditional styles seen in the illustration above, I love the new ways of wearing veils - short birdcages, boho styles, floral veils, coloured veils, funky ones with a statement headpiece, etc. But, of course, just like traditional veils, they're not for everyone. In fact, I'm not sure myself that my character and physionomy would allow me to wear a veil for any occasion! Am I too old for a veil? More mature brides-to-be often wonder whether a veil is going to make them look like mutton dressed as lamb. It needn't be! For those opting for a vintage style dress, birdcage veils look amazing on mature brides. And for traditional brides, a finger-tip, elbow or waltz length veil hanging down from an updo (not covering the top of the head) still looks beautiful whatever your age, if you are thinking about one for the full wedding effect. I have short hair, can I wear a veil? Absolutely! Talk to your hair stylist about how your hair will be done on the day, and get their advice on the best way to secure the veil. Perhaps a standard comb may not work, but a headband, crown, circlet or pins will do. Image above: Over-face veil with a bridal circlet by Blue Lily Magnolia. Works great with short hair, on a boho style wedding. We are not very traditional or formal, should I bother? Nowadays, veils come in all sorts of shapes, lengths, colours, textures and patterns. Whether you like feathers, stars, flowers, sparkles, bling, bright colours, it is possible to have any of these incorporated in a custom-made veil or headpiece with veil elements. If you love headdresses, then you should definitely look around for some quirky veil styles - you might find something that catches your eye. Should I go for a long or short veil? It all depends on your dress style, wedding theme and venue. There is no mathematical equation to define which veil you should go for, and the best advice is to try different ones with your dress, while considering the setting of the wedding too. A church wedding is a wonderful setting for a cathedral length veil, as the aisle is just the perfect setting to show off the veil. The traditional or formal wedding is a great match for longer veils as they are the perfect iconic representation of the bride. Shorter veils give a more informal, relaxed look - great for the modern or more casual wedding. Should I go for an embellished veil or a plain one? Again, the best advice here is to try different styles. As a general rule though, it is best to match the style of the dress with the style of the veil, while ensuring that there is the right balance of embellishment. More embellishment on the dress calls for less on the veil. On the other hand, a plainer dress can take a wider range of embellishment on the veil. If your dress has got lots of lace detail, a little bit of lace edging might look good, but not a lot of other embellishments such as flowers or sequins, which lend themselves to diffferent styles. How would my veil be attached? Generally, your hair stylist would be the best person to advise, depending on your hair style, the veil style, and where you want to position it. Veils tend to come with hair combs, which can be tucked into your hair; but can also be attached to headbands, hair grips, or secured to a bridal crown or circlet with hair pins. Tell your stylist if you want to remove your veil at the reception, or want it strongly secured to withstand all the party activities! Blue Lily Magnolia makes bespoke bridal accessories, including veils and headpieces. If you would like to have a custom-made veil or other headdress, get in touch!! 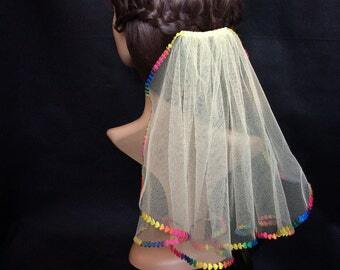 Short lemon yellow veil with rainbow heart edging by Blue Lily Magnolia on Etsy.